Mo–9Si–8B–1Ti, Mo–9Si–8B–1.8Ti, Mo–9Si–8B–0.2La and Mo–9Si–8B–0.4La2O3 (at.%) alloys were prepared using mechanical alloying followed by hot isostatic pressing and field assisted sintering. XRD, SEM and EBSD analysis confirmed the formation of Mo solid solution, A15 and T2 phases in the alloys. Isothermal oxidation behavior of the specimens was studied in the temperature range from 750 to 1,300 °C for up to 100 h. Both the Ti and La containing alloys showed superior oxidation behavior compared to unalloyed Mo–Si–B at 900 °C at the initial periods of oxidation. Ti-added alloys suffered higher rate of weight loss at higher temperatures (1,000–1,300 °C) due to the formation of non-protective low viscosity SiO2-TiO2-B2O3 scale. La-alloyed Mo–Si–B showed superior oxidation resistance at intermediate temperatures (900 °C) as well as at higher temperatures. 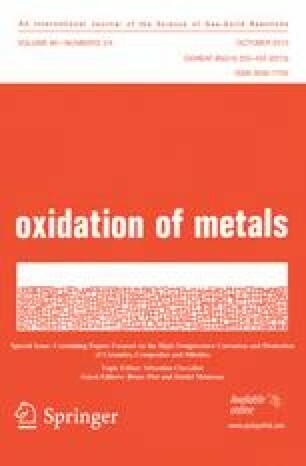 Enrichment of La at the oxide/alloy interface was found to be the reason for improved oxidation behavior of La-alloyed Mo–Si–B. Amongst the four materials studied, the La2O3 containing alloy showed the best oxidation resistance at 900 °C. S. Majumdar wishes to thank Alexander von Humboldt Foundation, Bonn for financial support of the research stay at Siegen. The research support by Deutsche Forschungsgemeinschaft (DFG) within the framework of the research unit 727 “Beyond Ni-Base Superalloys” is gratefully acknowledged.